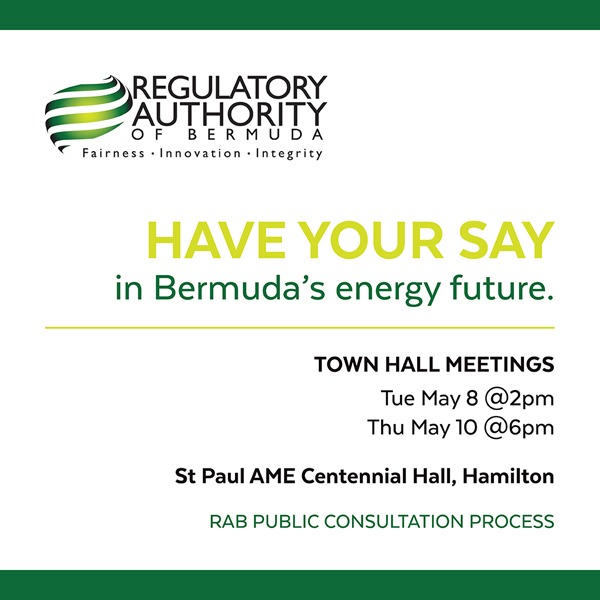 The Regulatory Authority of Bermuda is hosting Town Hall meetings starting today – Tuesday May 8th — with a second one set for Thursday May 10th. The public meetings are open to all interested parties to learn more about how Bermuda’s future energy plan will be developed and how to submit proposals toward the plan. The presentation will be led by local industry experts and consultants who have worked in the regulatory industry across many sectors, with a wealth of experience in markets of all sizes. The electricity sector is newly regulated in Bermuda and the Integrated Resource Plan [IRP] – Bermuda’s Energy Plan – is in a 60-day public consultation stage. The Town Hall meetings will outline the process and will explain the importance of a Bermuda Energy Plan. I will be interested to see the turnout. The IRP, which as far as I can see is essentially Bermuda’s future energy plan, is so full of jargon it is as dense as a novel. It needs explaining to the public in jargon-free language at large.